Fabulous Italian soft leather shoes by Sergio Borri. Beautiful cream leather upper and leather sole. Hardly worn and no scuffed to uppers or heels. Size 39 or UK 6. Fabulous for a wedding outfit. SUEDE 'T BAR' HIGH HEELED SANDALS. Russell & Bromley Women's Frame Work Mid Heel Trim Court Shoes - Beige-Uk 8. Euro 41 What the retailer say Elegantly feminine in design, Frame Work will become an office appropriate staple in your footwear repertoire. Beautifully crafted in luxuriously soft beige nappa leather with a contrasting patent block heel, this design has been accented with an oversized golden metalwork frame trim on the toe. Beige nappa leather uppers Leather lining Manmade sole Block heel measures approximately 1.5" Patent leather covered heel Gold hardware Made in Italy Post to the uk only Thanks for looking. Size 5 wide fit EEE. Hook & Loop wide strap with a gold toned faux button. Black Leather Cushion-Walk Shoes. RRP £49.50. A stunning classy pair of Mary Jane style bar court sheoe by M&S AUTOGRAPH. 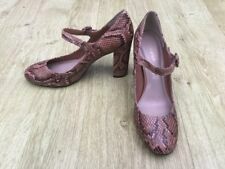 Genuine leather uppers in a snake print textured design - mix of browns and beiges. SUPER FAST SERVICE. (CLARKS SHOES. 25m from heel to toe and 8cm across widest part of foot). Black patent leather. NEW - a couple of minor nicks in leather lining at back of heel - see photograph. Size 5 Std width. Cushion Soft. - Black Leather Upper. - The Item Is In Excellent Condition. - Stylish and. VAN DAL SUKIE LADIES COURT SHOES. Lovely pair of Patent Leather Court shoes with 2” kitten heels. Has a feature now on the front with a small vent. soft cushion insoles. BLACK PATENT LEATHER. Marco tozzi shoes size 6. Condition is New With box and still tagged lovely shoes . Respira GEOX. T wo tone beige suede court shoes. S light dirty mark in left shoe, see last pic. Condition is Used. Here are a nice pair of Clark’s ladies l eathershoes in a lovely deep maroon colour. The main part of the shoe is textured leather whereas the toes are patent leather and the two areas of the shoe are divided by a black fabric band. Clarks Cushion Soft Court Shoes UK Size 8. In excellent nearly new condition Worn once Dispatched with Royal Mail 2nd Class. Soft black leather uppers with closed toe, ankle strap & 1.5" small block heel. Size UK 4 Eur 37. I will do all I can to resolve any problems. Ara Shoes Size 6 1/2 Uk. Dispatched with Royal Mail 2nd Class. Lovely Marks and Spencer’s Per Una Blue Mary Jane Shoes. T Bar With Buckle Fasten. Slim Bock Heels. Cut Out Detail To Heels And Toes. THESE SHOES ARE VERY WELL MADE AND BEAUTIFULLY DESIGNED, AND ARE IN VERY GOOD CONDITION. Ladies Shoes Size 8. Dispatched with Royal Mail 2nd Class. Sadly too big. From pet and smoke free home. Please take a look at my other items for sale thanks. Hotter Leather Court Shoes.Black reptile. Angelica. Work,Evening. 5.5.Dual fit. An elegant court shoe in a black patent reptile skin. Narrow platform. Dual fitting system- removable insoles. SLINGBACK PEEP TOE. SHOES SANDALS. LEATHER patent. good condition small black mark on heel. original price £120. THAT ARE NO LONGER REQUIRED/impulse buys ! my RADLEY handbag. DUE TO PRODUCT CHANGING. Marks and Spencer Footglove black leather/suede uppers and lining classic shaped court shoe, great for work/career/office. These stylish shoes feature a patent leather toe and heel and a grosgrain bow trim, see photos. Hobbs womens slingback open toe sandals size 40.5 or 7. Block 3 inch heels. In perfect condition - only worn once. Pale beige or cream colour leather. Dispatched with Royal Mail 1st Class. SIZE UK 9 E CLARKS ARTISAN ROSALYN WREN BLACK LEATHER BLOCK HEEL COURT SHOES. Condition is Used. Dispatched with Royal Mail Signed For® 2nd Class. Slight wedge on sole making heel look higher. Lovely shoes in box. Hotter Comfort Concept court shoes in black Size 5 1/2. They have a short front with a rounded toe and a chunky heel of 2 1/2" there is a decoration on the front with the leather pleated at the side. Christian louboutin Size 7 (40)Spike Court Shoes . Condition is Used. Still look in great condition but need heels repairing and new soles, timpsons will do this for £40 come with box. All spikes are still in perfect place and front of shoes have minimal damage. Very good leather and small court heel Dispatched with Royal Mail 1st Class. Lovely Brown Leather Court Shoes by Clarks. • Leather Interior & Insoles. • Brown Leather Uppers. • Rubber Anti-Sip Patch Soles. • Active Air. • Size 5 Standard fit. I will do all I can to resolve any problems. Hotter Shoes. The leather is like a croc style. Great shoes. Add To Favorites. HOTTER COMFORT CONCEPT EVELYNCream & Navy low heel shoes. UK 4.5 EU 37.5 USA 6.5. The Photographs shown on this page is the actual item for sale. I constantly have new inventory coming in. TH AN KS F OR L OO KI NG. QU AL IT Y SH OE S OR IG IN AL LY £ 18 0. Clarks 'SHOCK ABSORPTION' Black Leather Mary Jane Court Shoes - UK 5 - VGC. Size 5 black patent leather, block heel, leather lined court shoes.